Did somebody say fire? There was smoke in the air when I woke up in Sierra City. Nobody seemed concerned. They said it was coming from the North, and the new King Fire down South would be out by the time I would get close. I checked the fire reports and trail closures and all looked ok. Time to head out. It sure made for a beautiful sunset. I woke up the next morning covered in ash. It rained warm white flakes as I hiked on (jogged on in fear). 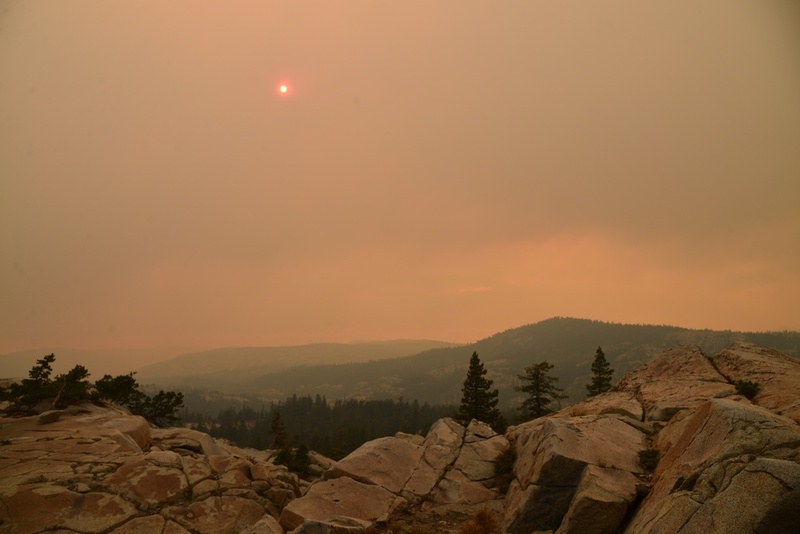 By 4 P.M., the smokey sky was orange and the sun was a bright shade of red, still hours before sunset. This was scary. I had no clue how close I was to danger and still days away from my next stop. It smelt as though the fire was just a few miles away. I made it through safely before the trail closed down, but this hiking stretch shook me up. Not something I would choose to do again or advise others to attempt, as well. My thoughts are with all those affected effected by the King Fire and all those who've worked at fighting it.